Lamoine State Park is a nice 55 acre park for those who want to escape the crowds on Mount Desert Island. It has an oceanside setting with picnic and campsite areas, hot showers, a dock, boat access, a pebble beach and allows fishing. 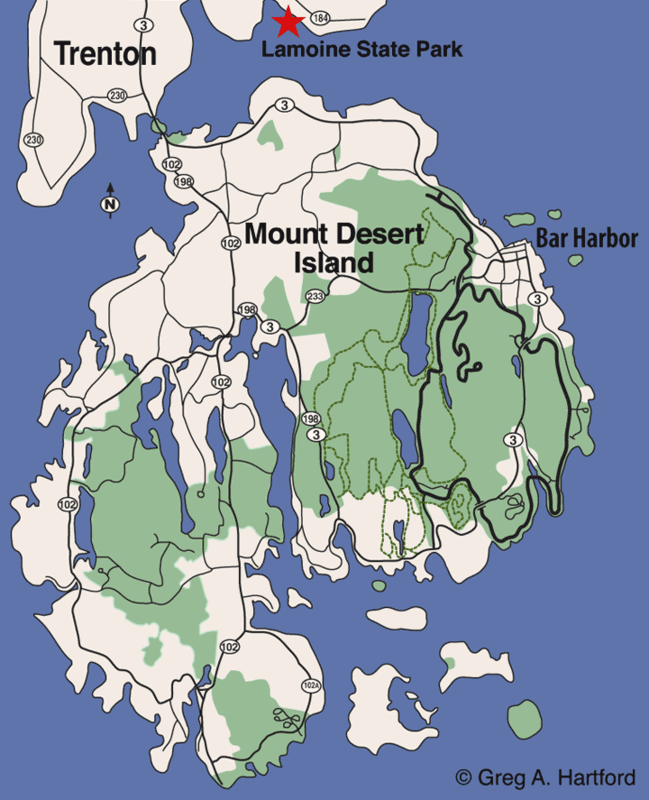 Since it is just north of the island on the Maine coast, there are great views of Bar Harbor on the northern side of the island and Cadillac Mountain. The nearby Ellsworth, known as the gateway to Downeast Maine, is the main commercial center. There are a few ways to get to Lamoine State Park but the most simple way to explain it is to go Down East on U.S. Route 1 from Ellsworth at the intersection near McDonalds Restaurant where Route 1 breaks off from Route 3. Continue East for about one-half a mile then take a right onto Route #184 and go about 8 miles. Watch for Lamoine State Park on your right. The Park is open from 9:00 AM to Sunset each day from May 15 through October 15. Even during off-season, you may park outside the Park Gate and walk into the designated Park area. However, the Park Facilities such as bathrooms are closed. Consider this State Park as a special oceanside location with fantastic views but without the larger crowds that gather on Mount Desert Island during the summer. Lamoine State Park, and its quiet little beach, is like the mouse that roared. Locals, and long-time visitors to this coastal area of Down East Maine know what a special little gem this place is. You have a front row seat to viewing Cadillac Mountain and Mount Desert Island while avoiding the crowds. It almost feels as if is part of your own family heritage. If you have children, I strongly suggest that you check this out at least once. Even if you do not, you will enjoy for numerous reasons. Note that this is a great place to lauch your kayak or canoe, away from the rough seas on the south side of the island. More than likely, you will want to come back again. Most everything in the area is a short drive away. Bring a beach chair, some food for a great picnic, and share it with some good friends!.